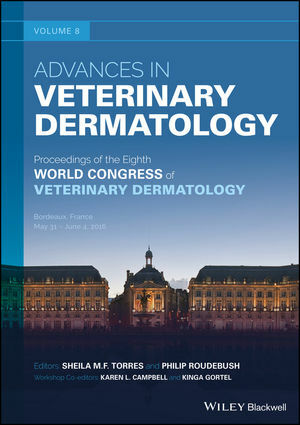 Representing the most recent developments in veterinary dermatology around the globe, Advances in Veterinary Dermatology, Volume 8, presents selected scientific papers from the Eighth World Congress of Veterinary Dermatology. The Congress, held in Bordeaux, France in June 2016, hosted an exceptional scientific program, with delegates attending from over 70 countries. These peer-reviewed and edited papers were published in the journal Veterinary Dermatology in volume 28 issue 1, and are included in this volume of the conference proceedings. Also included are 11 workshop reports which summarise sessions where experts presented topics in various areas providing a wonderful opportunity for colleagues to ask questions and exchange ideas in an informal atmosphere. Advances in Veterinary Dermatology, Volume 8 is a vital resource for all practising veterinarians and researchers interested in the field of veterinary dermatology. Sheila M. F. Torres, DVM, MS, PhD, Diplomate of the American College of Veterinary Dermatology. Professor in Dermatology at the University of Minnesota, College of Veterinary Medicine, USA. *This study was not published in the special issue of the Veterinary Dermatology journal (VDE 2017; 28:1).